Jason Sparaga’s entrepreneurial journey has been about creating solutions that reflect the fundamental tenet of business – that it’s all about customer choice – and then building innovative business models around it. At February’s MaRS Mornings – a monthly breakfast series that shares insights from innovators in the MaRS community – Jason shared some of the things he’s learned along the way. Coming from a long history of entrepreneurship, Jason started his first business while he was in university, where he sold flowers in bars and on street corners to help pay for his tuition. A few decades, several businesses and millions of dollars later, he and his business partner Andrew Clark started Spark Power. Jason and Andrew actually met at MaRS. 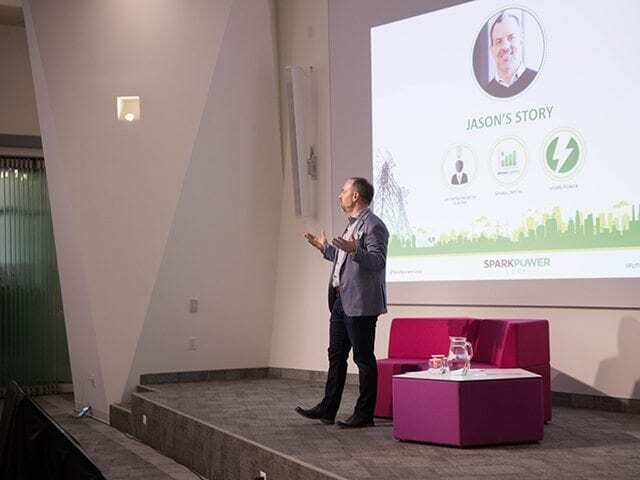 Spark Power originated when the pair realized that the new Ontario Green Energy and Green Economy Act (GEA) created a massive opportunity to support and create green power systems in rural Ontario. They saw that many big players were entering the market and were concerned, wanting the benefits of the act to stay local. That’s why they partnered with AGRIS Co-op, one of the largest agricultural cooperatives in Ontario with more than 1,200 farmer members, to launch AGRIS-Solar. The GEA introduced several programs that encouraged the development of renewable energy projects. For their first project, the Spark Power team had to work in a collaborative framework, bringing the farming community together with energy and financial regulators. Attractive rates for renewables led to a huge demand, creating a substantial strain on the grid infrastructure. Spark Power took into account the current models and physical realities of the grid and created solar gardens. This solution allowed farmers to invest in solar power without having the actual panels on their farms, which wasn’t feasible with the current grid structure. Spark Power considered the needs of the farmers, the grid, and the GEA, creating a win-win-win for the community, the regulators and the government. Jason attributes some of the success of Spark Power’s first project to empathy. With perseverance and a view to helping each party resolve their unique issues, the Spark Power team was able to find a balance within a government social program, merging socialist and capitalist ideas of cooperatives and management contracts. Since then Spark Power has transformed itself – primarily through a series of six acquisitions including Northwind Solutions, Pelikan Power Services, Rondar Power Services, Tal Trees Power Services, Tiltran Power Services, and Lizco Sales – into a company that today offers a vast range of services to help create and manage the future of power. In 2017 Spark Power merged with New Electric, almost doubling its size and revenue to approximately 500 employees and $100 million respectively. With increased renewables in the grid and increasing customer choice in the energy sector, new challenges around digitalization are emerging. Jason sees this as a unique opportunity to provide exciting services and products to the sharing economy market. He believes that distributed energy and deregulation will be the theme for the energy sector over the next decade and he urges budding entrepreneurs to look for new ways of doing business in this emergent space, which still has huge potential for disruption.